Thank you to David Schwartz, CEO and Co-Founder, Analytical Path for this Guest Post! Imagine yourself walking through the aisles at the supermarket. Everywhere you look—high, low and at eye-level—you are bombarded by thousands of products. Their colors scream with the brightest of reds and yellows (think cereal boxes) to more subdued and conservative-looking packaging, and everything in between. On their varied shapes and sizes their packages let you know in no uncertain terms that they are “new and improved” or offer “30% more”. All in all, it’s a sea of products but one thing remains constant: they all desperately want to get you to buy. Now go from the supermarket to the app store, such as iTunes or Google Play. The medium might be digital but the objective is very much the same for the 800,000+ active apps (on iTunes) on the store: buy me! Most apps engage you for but a fleeting moment with their icon, and what an important moment it is for that little image. That is where Analytical Path comes into the picture. We help bring app developers together with a community of evaluators (normal people who like apps) so that the latter can provide valuable feedback and opinions on what works and doesn’t work in app marketing – icons, screenshots, descriptions, etc. 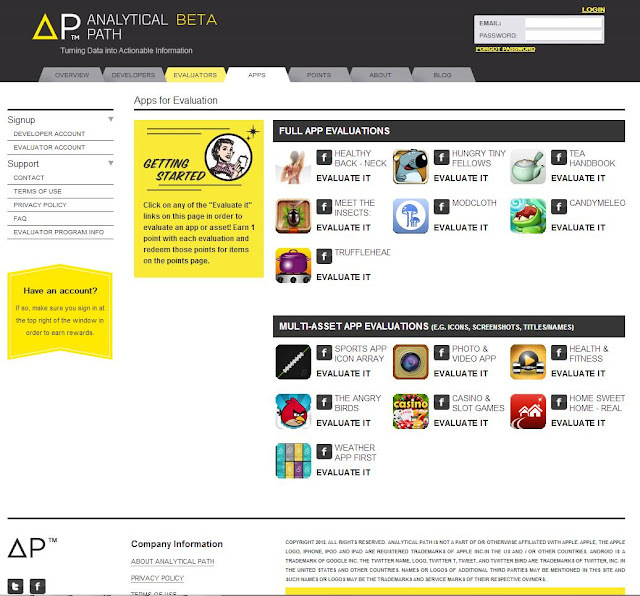 In return, evaluators earn points for each evaluation they perform, which they can then redeem for items on our store. We hope you’ll stop by, sign up (its free), and start checking out the apps. Thank you!